Rise time to 350°C is 20 seconds faster and tip temperature drop is reduced during continuous work. Able to shorten the time required for the same work and improve work efficiency significantly. NOTE: For SMD work, you can use the Hakko FX-8804 SMD Hot Tweezers with the FX-888D station (shown below). How to remove the bottom plate. 1. Press the slide lock button inward. NotePress it firmly from upward. It is easy to open by the slide lock sloping inward. 2. 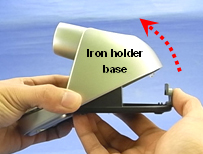 Open the iron holder base while pressing the slide lock. 3. 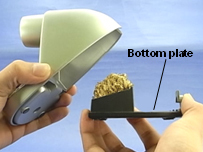 Remove the solder waste in the bottom plate. 3.9(W) x 4.7(H) x 4.7(D) in. 9.5(W) x 7.0(H) x 9.5(D) in.